Super Cool Facebook Welcome Page! Anyway...I have been nagging myself to figure out Facebook since they made some design changes. Yes...I've been slow. It's that kind of thing that chants in your brain..."you gotta do this...you gotta do this..."
Well, I finally sat down and checked some stuff out...did some Googling...and walla! This is my new Facebook landing/welcome page! Check it out live here. You know I like to long story short things. I've been digging around for third party sites since I don't know fbml (sadly, I don't even know what it stands for) anyway...I found two that I like. Second, the upside, Holy cool Batman! I'm telling you, you can add multiple pages, product pages, videos, galleries, links...it's pandemonium! Check out Shortstack, and Pagemodo. Both are super cool, and both have a ton of options. My page was made in Shortstack. I'm sure if I keep it, I will be paying a monthly fee. What do you all think...Do you like cool custom Facebook pages? I'm thinking about doing a giveaway...but I'm not sure how to do it yet...I suppose maybe a free welcome page. Tell ya what...like me on my cool new page, and then come back when I tweet/facebook out the contest. I like it - it looks GREAT. I had to figure out what was different between your link above and your 'old' page where we are friends. I do think people who want custom work will pay a nominal monthly fee for something different that the rest! 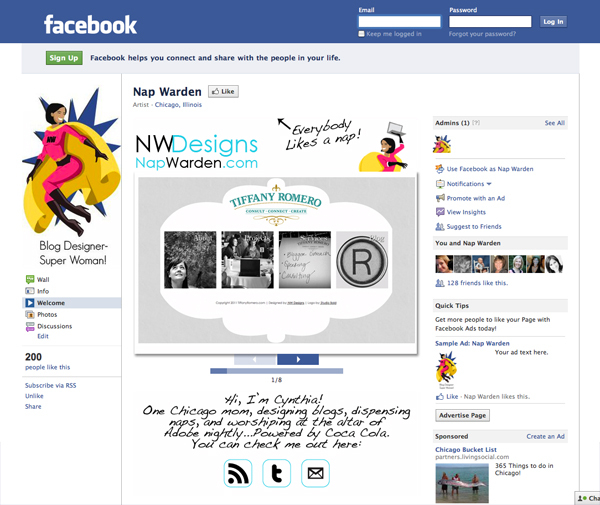 Your new Facebook landing page looks awesome! I love it!! But you already knew that!! Love love it! You so talented mama! Very fun! You're so creative!